There's nothing like a casual dress for a hot summer day. I have several basic tee dresses in black, gray (a little longer) and navy (ok some stripes too!) that are summer staples. I love these simple dresses because you can do so much with them. One of my favorite ways to style a casual dress is to add a vest. 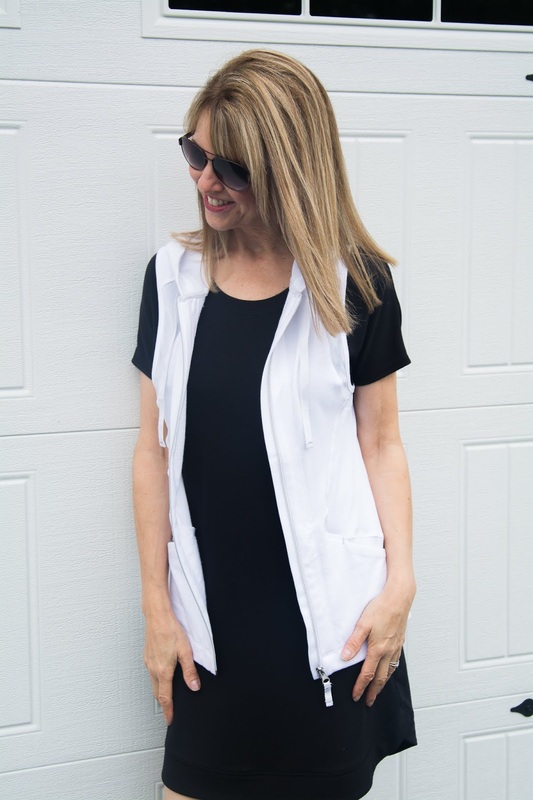 This FABULOUS little white hoodie vest from Peach layers so well. I wear it with a tank and shorts or jeans, or over a simple dress as shown. It's also a great piece to wear with workout clothes too! Pockets are always a plus for me!! Love this vest! Because I'm a big metallic fan, I recently nabbed these Reebok metallic sneakers. They makes dressing casually a little more fun! Find them here. Hope the week is going well for you. I'm still unpacking boxes if you can believe it---how did I accumulate so much stuff?? The Peach vest and Jetzy Bag were gifted and some of the links in this post generate a small commission. But rest assured, I only post what I love. Promise! Last month, I bought a chakra jewelry bracelet. The design is so unique and looks really casual. All of the stones were perfect and very unique in color and best in quality. The price was also very reasonable and the best part is, they ship worldwide and they offer to return and refund policy too.